I have the same tights! They look great styled with this outfit! I also have an obsession with online shopping, it's just too easy! 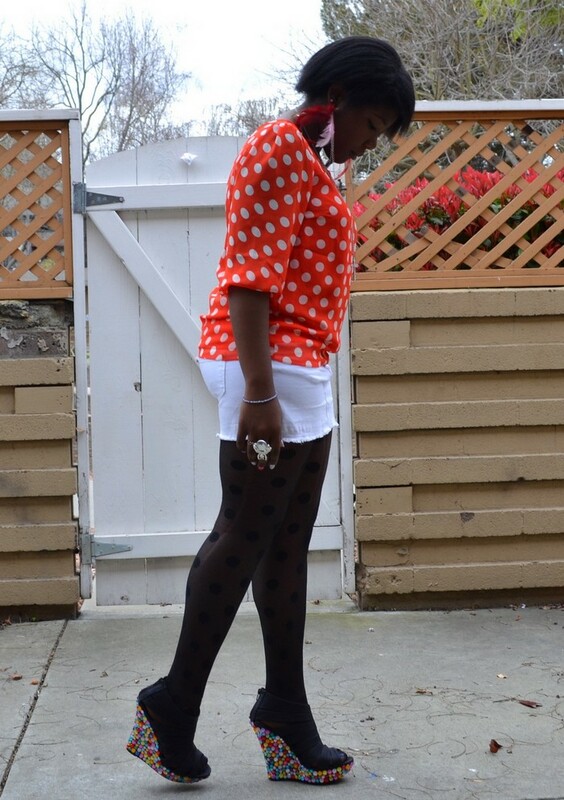 Love how you paired that pretty orange polka dot top with the polka dot tights and those shoes are so much fun! Thank you very much! I'd love to see you rock that top! I love the polka dots theme in your outfit, and your DIY shoes... Hmmm, looking for a pair of heels to do this to. So cute! Those Tights are the best! wow, polka dots, it so cute, one of my fave print! cool post! you have a great sense of style! and those wedges are amazing!!! YOUR SHOES ARE KILLING ME. I love them with all my heart. Thank you sweetie!! I bought them at Ross but there wasn't any gems on them! I added them myself!! j'aime beaucoup ton top! le dos est superbe!